How much does it cost to travel to Perth? How much money will you need in Perth? AU$160 ($115) is the average daily price for traveling in Perth. The average price of food for one day is AU$44 ($31). The average price of a hotel for a couple is AU$183 ($131). Additional pricing is in the table below. These average travel prices have been collected from other travelers to help you plan your own travel budget. Capital of Western Australia, Perth is a city that sits where the Swan River meets the sea, and given its ocean side location there is plenty to see and do on the water and beyond. Spend a day on Perth's sandy beaches or get lost in its parks and gardens, sail down the river or enjoy the city's history and culture visiting museums and historic sites, shopping, dining, and much more. One of the most iconic sights of Perth is Kings Park and the Perth Botanic Garden. One of the biggest city parks in the world, it covers an area of almost 1,000 acres. From the park, visitors can enjoy sweeping views of the Swan and Canning Rivers, the city skyline, and the Darling Ranges to the east. There is also a large network of walking trails, recreation area for families, and the botanical gardens which have over 3,000 species of native flora. The city has plenty more to see, so check out these Perth photography locations for some good ideas of where to go to find inspiration. As far as history and culture goes, Fremantle Harbor is home to colonial remnants like Fremantle Prison, the Arts Centre, and Old Courthouse. The Maritime Museum and Shipwreck Galleries allow visitors to dive deeper into seafaring history, while the Sail & Anchor pub is a landmark that dates to 1843. Other sights that pay homage to Perth's heritage include the Western Australian Museum with a collection of local science and culture, as well as the Art Gallery of Western Australia which has an extensive display of Indigenous art. The Perth Zoo, dedicated to wildlife conservation, is also worth a visit. The Perth Metropolitan area is divided into a few districts and neighborhoods. The suburbs are mainly residential neighborhoods except for an aquarium in the Northern Suburbs above the river, and a zoo in the Southern Suburbs below. The Hills are known for its wine, trees, and national parks, while the Coast is the prime place for swimming and beach activities. 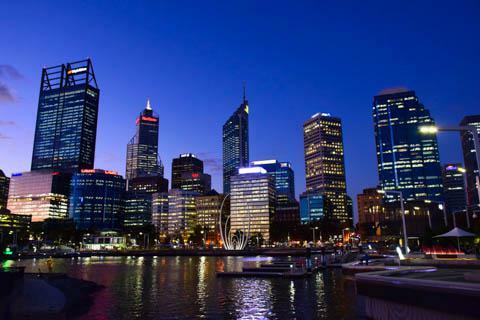 The center of Perth is marked by the City which is mainly business and commerce, while the neighboring Northbridge district is the hub of culture with plenty of restaurants, bars, cafes, and art. This is one of the more popular tourist centers, as is Freemantle down by the water. As the city's port, it has much to offer in history as well as in food and entertainment. Perth has some of the best beaches to be found in the country. The more popular and easiest ones to reach by public transportation are Scarborough and Cottesloe beaches. Since these are open ocean beaches, it is advised to swim between the flagged patrolled areas of water. There is also a clothing optional beach that is mostly for sunbathing called Swanbourne. Another fun day trip is to visit the car-free Rottnest Island, which can be reached by ferry, helicopter, or private boat. The island has more than 60 beaches, and opportunities for snorkeling coral reefs, diving shipwrecks, exploring history, and spotting local wildlife. In the opposite direction, inland to the Hills, you can also opt to take a wine-tasting day trip through Perth's Swan Valley. This is the country's oldest wine region with some of the best wineries and micro-breweries to be discovered. Other activities include the Adventure World theme park, cycling, river sailing, and more. One of Perth's specialties when it comes to food is a Western Rock Lobster, known locally as crayfish. A major industry of the city, most of the crayfish is exported for a hefty price; however you will be able to find it cheap in Perth, especially in the summer season. Being a city by the sea, another of Perth's local dishes includes Chili Mussels, which consists of mussels cooked in tomato and chilli jus, available in many restaurants. Northbridge, close to the city center, is a great place for enjoying restaurants and nightlife, as is Fremantle located down by the water. Be aware that most places stop serving food after 10pm. There is also a vibrant coffee culture throughout Australia, with clusters of European style cafes lining the streets around Perth's city center. Other specialties surrounding the city include truffles grown around Mundaring and Manjimup, plenty of local produce, and a number of wineries. The airport serving the city is Perth Airport, offering both international and domestic servicesthough the terminals for each are located on opposite ends of the runways. There is a free transfer bus operates between them. While boat was once the only way to reach Perth, there are now only a handful of passenger ships docked at Fremantle, the city's port. There are also a few cruise ships that dock here. By train, the Indian Ocean trans-continental railway runs from Perth to Sydney via Kalgoorlie, Adelaide, and Broken Hill. The journey takes four days and three nights and is a bit expensive, though it traverses a beautiful route.